I was so excited when I finally picked it up because the premise hooked me. What I read did not live up to my expectations and I finished the book knowing I would not continue the series. Aurora (Rory) was an American teen that was given a great opportunity to spend her senior year in London. 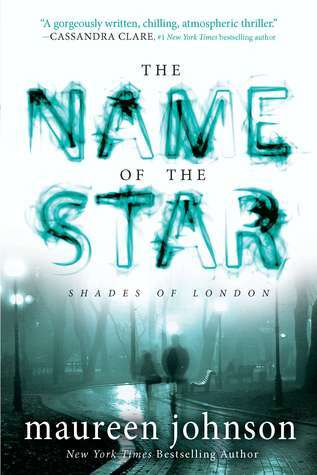 The day she arrived in London she learned that there was a serial killer on the loose and the killer mimicked the infamous Jack the Ripper murders. The killer was never caught and murders continued happening closer to Rory’s school. Things change for Rory when she crossed paths with the killer but the catch was that she was the only person who could see him. She quickly realized that she had the ability to see ghosts. I sort of checked out after that. I was fascinated with the premise of a Jack the Ripper cases sprinkled throughout the story but this book failed to hook me. The writing itself was what turned me off from caring what was going on. It did not feel like solid writing. Things felt sloppy, rough, jagged, and thin. This was not Johnson’s first book but it certainly felt like it. I expected more solid writing. The characters were not flushed out nor was the actual plot developed. The characters had the personality of a wet sponge and had zero character arc. They were all completely forgettable. Johnson tried far too hard (and failed) to create an arch-nemesis for the MC. There really was no solid reason to hate this girl other than I was told I needed to strongly dislike her. That doesn’t work for me as a reader. I never understood why I was constantly being told to hate a character that was head-strong and had a plan to get what she wanted. In fact, it really bothered me that instead of encouraging girls like that, I was being told to bash them. Sorry but I’m not here for that. There were other things that stood out in a negative way: Rory was supposed to be in London to stay with her parents but they were absent the entire time; the incompetence of the local police; and the lackluster villain. All of these reasons and a few more solidified my decision to not continue with the series. I expected so much more but walked away disappointed.